Don’t make the outdated choice when you update your floors – use these 2017 carpet trends to choose durable and stylish carpet tiles that will stay in style the lifetime of your floor. Current carpet trends are unlike anything else trending in flooring today. In hard surfaces, everything is about mimicking wood and stone looks. Soft flooring is a whole different ball game. Carpet is a largely controversial flooring subject. Not controversial in any sort of real argument sense, but people seem to either love it or hate it, and the ones who hate it will try to convince you that carpet is on its way out. 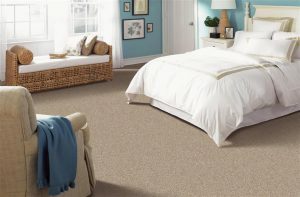 Many homeowners still seek out the soft, cozy comfort of carpet. In fact, carpet is our #1 home flooring seller (with vinyl quickly sneaking up behind it). While other home flooring trends are all about wood looks, carpet is coming out with some bold and stylish trends of its own. Get ready to see some new statement looks and a lot of environmentally-friendly flooring. “We at Shaw have found through our studies that people have said the current carpet shopping experience presents a sea of sameness of similar options. People want color, style, and love how it makes them feel but have expectations on performance. In 2017 we will introduce new constructions with bold colors along with balanced warm neutrals, popular grey’s and taupe’s, and many more of today and tomorrow’spopular shades. 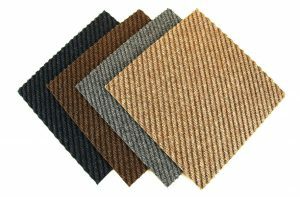 We also have updated our revolutionary Life Guard backing carpet offerings. This innovative flooring solution was introduced last year as the only residential pet friendly carpet that has a built in moisture barrier while maintaining exceptional styling and design. It also has a lifetime warranty against pet staining. It’s SIMPLY AWESOME!” – Tim Braten, Shaw Inc. If you don’t know much about carpet, you may not even realize that you have countless types to choose from. Of course, not all carpets are created equal, and carpet is usually a commitment you plan to keep in the home for some time. Here’s what’s hot in carpet right now. 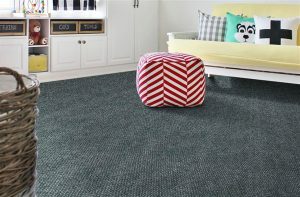 “Green” or eco-friendly flooring is a huge trend right now, and carpet is no exception. In fact, most carpet manufactured today is made, at least partially, from recycled material. Homeowners and manufacturers alike are paying more attention to our environment. This is a trend that will only get stronger with time. What is this cut and loop carpet we speak of? Well, it’s carpet that combines both cuts (straight) and loops (the ones that look like a little loop, like Berber). You know how they say trends tend to recycle themselves every 30 years or so? Even less in fashion – remember 5-10 years ago when everything hot looked like the ‘80s called and wanted their wardrobe back? 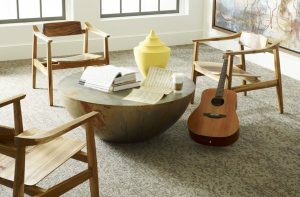 Cut and loop carpet was first popular in the ‘70s, lost steam in the ‘80s, and is now returning full force. 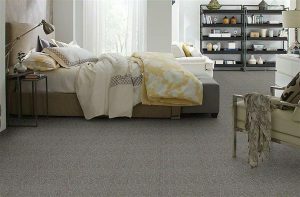 Cut and loop carpet offers lots of patterns and texture options – a big reason it is so hot right now. We’ve already seen this trend come and go once before. I think it’s safe to say history will repeat itself, but that doesn’t mean it will never come back again! Okay, so if you’re not in the market for a frieze carpet, you probably have never heard of it or have no idea what it is. Frieze is also known as “twist” carpet and it refers to carpet where each piece of the carpet is twisted many times, making it look almost curly. You know when you sleep with your hair in a braid and then it has it’s kinda wavy the next day? That’s how frieze carpet looks. Everyone’s been after natural curls for so long, they even want it in their carpet! Mostly kidding. This look is relatively new, and will likely continue at least over the next decade. After that, it’s anybody’s guess! These are so cool! I mean, we think so. You have an almost endless list of options to create custom rugs by choosing carpet tiles and linking them together. This trend is popular with families because if one part of your rug gets damaged, it’s just a carpet tile, and you can easily replace it. 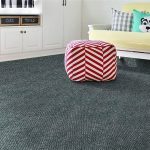 Rugs have never gone out of style, and we don’t see any reason why carpet tile rugs won’t last the test of time as well. 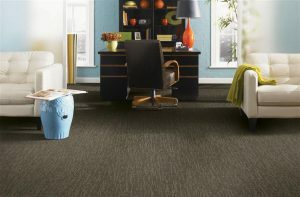 While other floors are trending towards extreme lights and darks, carpet is going bold in its color statements. Of course, some classic staples are still hot, too. Homeowners are trending towards statement colors with their carpet. Since carpet is not typically a whole house flooring these days, you have the ability to make a statement. Oranges, purples and multi-colored carpets and rugs are popping up all over the place. Your carpet no longer needs to be that forgotten stepchild that you never see or hear from. For now, they can speak loud and proud! While bold colors are having their day, bold statements tend to be fleeting, and will likely be gone in a few years or so. 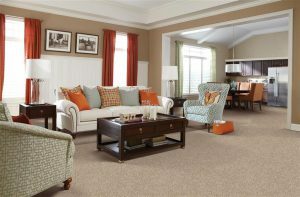 If you want to go bold, I suggest using carpet tiles or an area rug so that when the trends change, your home can too. Ahhh, an old staple. A trend? Perhaps not. More like a classic. 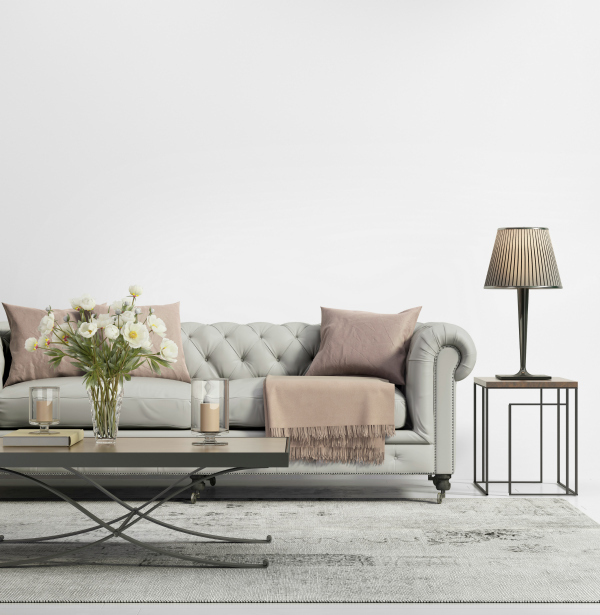 Neutral carpet matches the colors and tones of hard flooring, and also gives you a blank canvas to build on for decorating your home, painting, choosing furniture, etc. It’s easy to stick with staple and use other items in your home as your statement pieces. 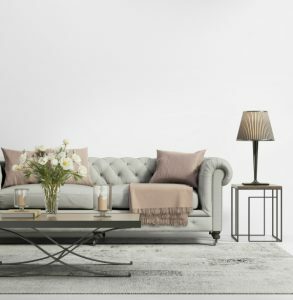 Although bright colors are trending, neutral carpets are still popular today, and these browns and grays will probably remain popular for decades to come. 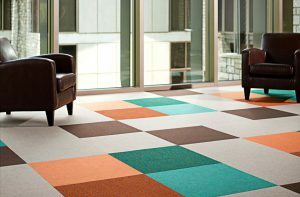 Related post >> Why Choose Carpet Tiles? Wood isn’t the only flooring that can play with textures! Carpet may be limited in some ways, but there are a lot of textures you can achieve with carpet that hard floors just cannot match. Remember when everyone stopped using soft, plush carpets? It was the saddest of times. Softness is exactly what makes carpet special, and that ultra softness is something hard floors just cannot compete with. Soft carpet will always have its place. It may become more and less trendy throughout the years, but until they come up with an equally comforting option, this trend ain’t going anywhere for good! 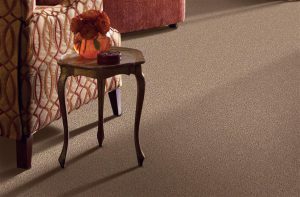 Ribbed carpet is exactly how it sounds – little ribs of texture throughout the carpet. It’s one of those things you don’t realize you’ve seen until you see it. Ribbed carpet has been popular in offices for quite some time, and in 2016 you will begin seeing it in homes as well. 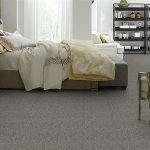 We don’t expect this texture to stay around in homes forever, and we anticipate that within the next few years ribbed carpet will be back to more of a business look. 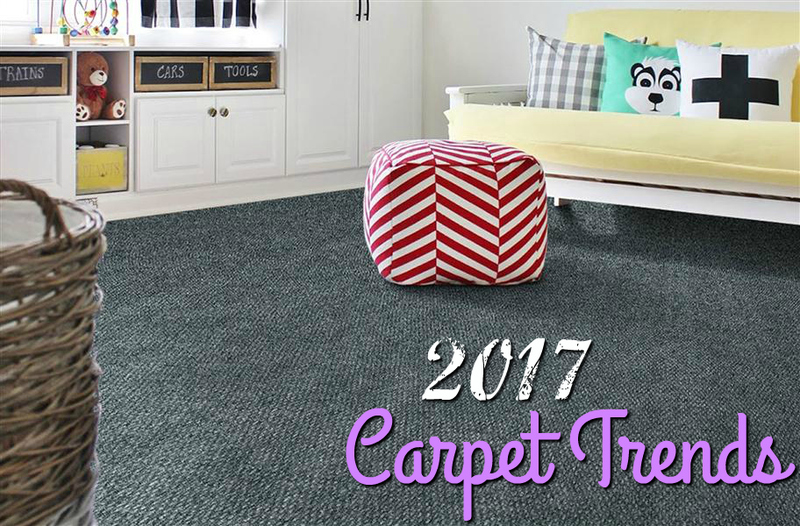 In 2017, say goodbye to solid, one color carpet; now you will see bold, new, eye-catching patterns. In 2017, you’ll see full broadloom carpets with circles, hexagons, arabesque and other shapes. Of course, some will be classier than others. Will they last? Well, we don’t see any reason why the more subtle, classy patterns can’t stay current. Big, bold patterns, however, will likely go out of style in the next 5-10 years. At least, until they are revived in another 30. Similar to broadloom carpet shapes, homeowners are using padded carpet tiles to create shapes and designs through the layout of their tiles. In 2017, you’ll see a lot of mixing and matching colors and patterns to provide a unique, one-of-a-kind look. We predict this look will stay current in business offices, but we only give it about 5-10 years to maintain its residential popularity. As you can see, there’s a lot going on in the carpet industry right now. There are plenty of different, unique options trending that will likely stick around for years to come, which means your possibilities are endless. If you want something hot that will last for the long haul, we recommend going soft, plush and neutral. 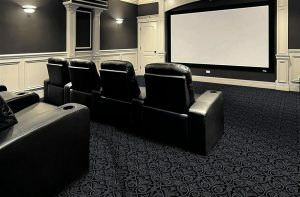 And if you want to know more about carpet trends, check out this post from Floor Covering News. This is a very nice post. And colorful rugs are on the rise now. Unfortunately, I’m unfamiliar with tartan carpet so I’m not sure how things will go. It looks like tartan carpet is mostly popular in the United Kingdom and this trend has not made it’s way to the states just yet. Is Berber still current? And if yes in what colors? My sister and I are in the process of readying my father’s home in a modest South Florida neighborhood for sale. She wants gray carpeting, I say neutral beige is the way to go. What are your thoughts, and is there a particular color combination which would appeal to most potential buyers? 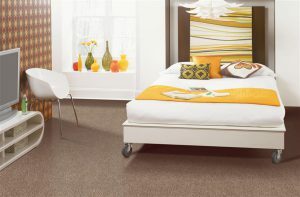 We plan on carpeting the entire house, bedrooms and living areas, with the same carpeting to save on costs. Awesome post! There are more varieties of carpet we can choose, so I’m excited about how some places are going to look. 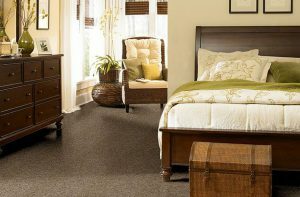 Every carpet is unique, so it will have its own unique problems and proper ways to take care of them. Thank you for the article. I bought karastan gray carpet and had to take it out. The shading was awful. You couldn’t walk on it without leaving shading. Very costly mistake. Don’t buy it. It looks beautiful until it is laid. My best suggestion is to bring in some samples of the colors you like and make sure you like the way everything goes together. Honestly, if you want a big, bold color statement, go for it! Why not? I think it sounds fun! 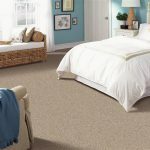 I own a carpet and rug cleaning company, and am always looking at the latest trends in carpet because we actually have started to perform some carpet installations for our clients. Every one of them have been asking what’s in right now. I enjoyed this. I like what you said about how bold carpets are in trend right now. I think it would make my house very updated and add a good pop of color to the room if I had some brighter carpet. I will have to look into a company in my area that can install some awesome new carpet for me. Glad you found these trends helpful! We’d be happy to send you some free samples to check out if you’d like. Good luck with your update! My wife and I are remodeling our living room at the moment, so thanks for the tips on buying new carpet. I like your point about how soft carpets are always going to be comfortable. 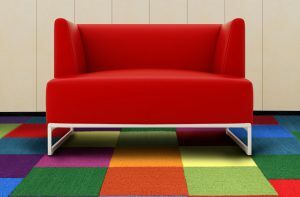 We’ll definitely consider getting a carpet with softer fibers so it’s better for the kids. Glad you found it helpful, Derek! Thanks for helping me learn more about carpet. I didn’t know about the frieze carpet or that twists different parts of the carpet. I’m very interested to learn how it’s manufactured or produced, especially if it uses a lot of very small twists. Glad you found it helpful, Taylor! I like how you mentioned that bold carpet colors are still in style. It makes sense that they would pop and speak loud and proud, as you added. I am thinking of remodeling one of the rooms in my house into a playroom! I think having brightly colored flooring would be a great option for that specific room.